Some interesting food blogs I've found recently. 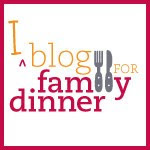 FamilyFood (aka CityMama) a mom that can cook, likes to cook, and stands up to food snobs and others who doubt that this is a worthwhile endeavor. Gotta love it. Fork and Bottle: wine and cheese reviews, and links to interesting books and cooking with kids, California-based. What's Cooking: San Francisco-based, green business that teaches cooking classes for kids, with great product catalog and books. 101 Cookbooks: Lots of recipes, nice pictures. Real Celebrity People Eat Real Food? Deceptive Delicious? Or too much of a Cheat?